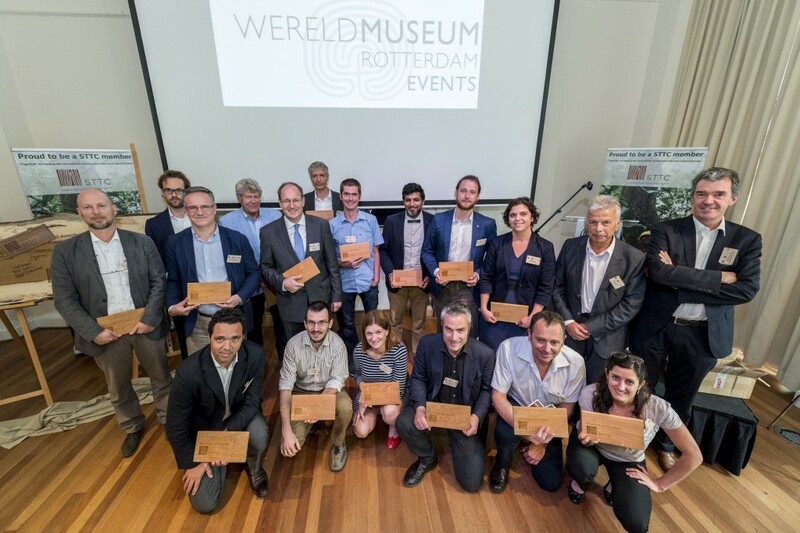 The European Sustainable Tropical Timber Coalition (STTC) Conference in Rotterdam came to resoundingly positive conclusion when the host city itself officially joined the organisation. The theme of the June event, co-organised with the Dutch Ministry of Infrastructure and Environment (MIE), was ‘Real impact through timber purchasing policies’. It centred on the STTC’s core view that creating market demand for certified responsibly sourced tropical timber is key to incentivizing sustainable forest management in supplier countries. The STTC launched in 2013 to deliver this message across Europe, where tropical timber sales had been in long-term decline. Founded and funded by Dutch government-backed IDH, the Sustainable Trade Initiative, with the Dutch Ministry of Economic Affairs, it now has 80 members and rising; including timber traders, federations, end-users, specifiers, retailers, local and national government bodies, certification organisations and NGOs. Their initial aim is to boost certified timber’s European tropical market share to 50% over 2013 levels by 2020. Among the STTC’s latest developments is a €2 million funding programme, managed by Principal Partner the European Timber Trade Federation (ETTF), to support businesses, federations and local authorities implementing sustainable timber procurement policies (STPPs). It is also increasing communications activities, with the Rotterdam Conference among the outcomes. The event attracted nearly 100 people from across the STTC membership, plus delegates from associated areas. Opening speaker Hannie Vlug, MIE Sustainability Director, highlighted the impact government and private sector STTPs could have together. “Governments can lead by example and use procurement policy as leverage, incentivizing companies to bring sustainable products to market,” she said. The Netherlands’ procurement system, she added, had contributed to a rise in sustainable timber market share from 13.4% in 2005 to 74% in 2013. IDH Programme Director Hans Stout described his organisation’s leading role in supporting tropical forest certification, but stressed that a viable market for the resulting timber was equally critical. “That’s why the STTC is focused on stimulating demand Europe-wide,” he said. Researcher and Chatham House Associate Duncan Brack further emphasized the power of government working with industry to shape procurement. “In most developed countries, government buying accounts for 10-12% of GDP, but its impact on wider business procurement can increase that to 20-40%,” he said. Encouragingly, he added, the number of government STPPs has risen from eight ten years ago to 33 now. Robert Kaukewitsch, EU Green Public Procurement Officer, said the EU aimed to ‘create an enabling environment’ for industry and governments to establish STPPs, including allowing environmental criteria in tender procedures. It was also now focused on how STPP’s could accommodate FLEGT licensed timber. Stephane Glannaz, Chief Commercial Officer of tropical supplier and STTC participant Precious Woods, said that to encourage implementation of STPPs, in turn, the tropical timber sector must highlight the wider values of sustainable forest management. In particular that included linkage with climate change mitigation. A presentation on the Netherlands’ Green Deal, the country’s public/private sector alliance to further boost certified sustainable timber’s market share via STPPs, was given by Maja Valstar, MIE Sustainable Timber Advisor, and Paul van den Heuvel, Managing Director of the Netherlands Timber Trade Association. Core to its success, said Mr van den Heuvel, was clear messaging on the sustainable timber market’s role in forest maintenance. “We put it simply,” he said. “Use it or lose it.” He added that the project’s various partners were now working on Green Deal II. Peter Gijsen, Corporate Social Responsibility Manager of global construction giant Royal BAM Group, said his sector was increasingly focused on sustainable materials procurement as it reached the limits in improving environmental performance through building energy efficiency. The conference also featured lively workshops tackling a range of private and public sector STPP issues; including designing procurement policies, financial instruments for driving sustainable timber markets, STPP’s and contracts and tropical timber’s image. Concluding ETTF Secretary General André de Boer said there were early signs that efforts to strengthen the sustainable tropical timber market are having an effect. 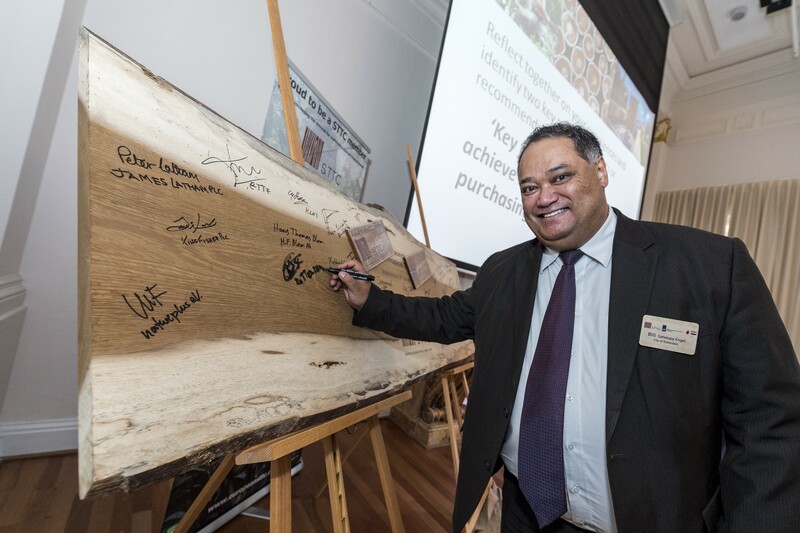 Subsequently the City of Rotterdam marked becoming the latest body to add its name to the Coalition, with Senior Procurement Officer Bill Sahetapy Engel ceremonially signing a section of tropical timber. “We aim to be the world’s most sustainable port city and see joining the STTC as integral to that,” said Léon Dijk, Sustainable Procurement Specialist at the City Council. Mr Engel signs up to the STTC on behalf of the City of Rotterdam. Other Conference speakers included Eric Boilley, Managing Director of French Federation Le Commerce du Bois; Alberto Romero, Director of Spanish Federation AEIM; Nils Olaf Petersen, Foreign Trade Department Head at the German Federation GD Holz; Ted van den Put, IDH Executive and Programme Director; Mark van Benthem, Probos Senior Consultant and STTC Advisor; Ulrich Bick Thünen Institute procurement and certification specialist; and Peter Defranceschi, local government sustainability organisation ICLEI’s Brussels Office.